Pumped Up Kicks | Fit Families | Kids VT - small people, big ideas! When my family of five arrives at Yordan's Black Belt Academy, the room is already teeming with people. Normally, if I saw a group of kids and adults punching and kicking each other, I'd call the cops. But this is a tae kwon do dojang, so it's OK.
Friends and parents kibitz and children zoom around while we hurry to remove our shoes. Master Leonard Yordan calls for order and the din subsides. The beginner class tonight has 24 students, ages 3 to 50-plus. Moms and dads, computer technicians, kindergartners, executives, high-schoolers and cashiers all have exchanged their everyday labels for white uniforms and belts. Students line up neatly in four rows of six before bowing to the U.S. and South Korean flags, Master Yordan, and the senior-ranking student. We warm up with basic stretches, simple hand techniques, push-ups and crunches. Master Yordan demonstrates a side kick. He explains how to do it properly, breaking the move into four parts. His instructions are easy to understand, even for the littlest practitioner. "Tae kwon do is dynamic," he says. "It's based on the body's natural movements so anyone can do it. Make it happen." People take turns kicking cushioned paddles held by black-belted volunteers. More experienced students make a short abrupt sound — ki-yup — the moment their foot connects with the target. The vocalization helps with breath control. Newer students ki-yup softly and giggle self-consciously. Everyone exchanges high-fives as they return to the ends of their lines. "Good try!," "Nice kick!" and "Great work!" echo around the room. This is not the intimidating Cobra Kai dojo from the Karate Kid movie. Normally, what interests one of my children bores another. My ballerina, little leaguer and dramatist don't often agree — except in their love of tae kwon do. We put our oldest son, Liam, now age 11, in classes six years ago and I joined him 18 months later. My husband, daughter and youngest son put on white belts in 2010. "We've had many families train together at YBBA," says Master Yordan. "Unlike soccer or hockey, tae kwon do is an art you can practice with your children and learn as they learn." As class ends and we bow out, I consider what tae kwon do means to our family. What started as a way to help Liam successfully control his wiggly body has turned into a family experience: a blend of physical and mental challenges that we embrace individually but get to share collectively. Like many arts, what's learned in the classroom impacts life outside of it. The tae kwon do tenets are: self-control, perseverance, integrity, courtesy and indomitable spirit. When my children demonstrate these qualities outside the dojang, I make the connection for them: "It took integrity to admit you were wrong." "It's hard to learn to ride a two-wheeler, but you didn't give up." Sometimes, they make the connection for me: "Mom, you didn't get mad about the mess we made!" "Fit Families" is a monthly feature that offers easy and affordable ways to stay active. Got an idea for a future FF? Email us at ideas@kidsvt.com. Mary Kinney blogs at www.oinktales.com and lives in Essex with her husband and three kids. Equipment: Comfortable clothes, such as sweatpants and T-shirts. If you join the academy, a uniform is required. 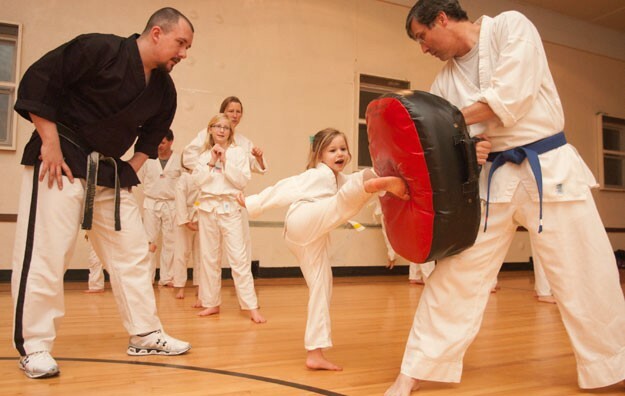 Where to Go: Yordan's Black Belt Academy: 10 River Road, Underhill. 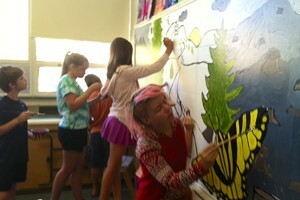 Classes held at the Underhill ID School. 305 Flynn Avenue, Burlington: Classes held in St. Anthony's Church gymnasium.